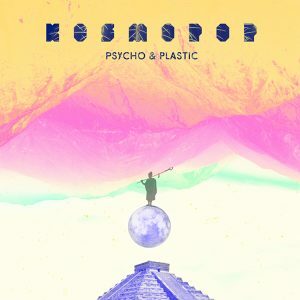 Label heads Psycho & Plastic let their passion for nonconformist electronic music reign free on their first full length album Kosmopop. Recorded in seclusion in the East German town of Chemnitz, Kosmopop was meticulously embellished and perfected in Psycho & Plastic’s Berlin studios over a period of almost two years. Heavily influenced by the 1st and 2nd summer of love – especially the mystical view on the wonders of inner and outer space from 1960s psychedelia, science fiction writing, and 1990s rave culture – the album is a musical discovery of an imaginary galaxy, its planets and inhabitants. As such, it also serves as a metaphor for the fearless exploration of the Unknown. The outcome is a highly optimistic dance album with dark undertones, featuring a unique sonic palette of analogue synths, alien guitars, organic sequencing and otherworldly vocals. Its mind bending eclecticism ranges from the gravitational pull of bass heavy, krautrock-infused opener “Black Hole Acid Test” and the crisp funkiness of “Planet Seductron” through to the short ambient tracks “Boojum” and “Superflare” that frame both sides of the vinyl. The emotional turmoils of “Divine Loser”, a melancholic ode to the Merry Pranksters disguised as a trippy stomper, and cosmic funkster “High Priests Of Stimulacrum” find their resolution in the high flying and atmospheric “Esoterra”, a closer with a relentless kick drum fit for any dance floor at sunrise.